For many people, soaking in a hot tubs can be a relaxing activity. 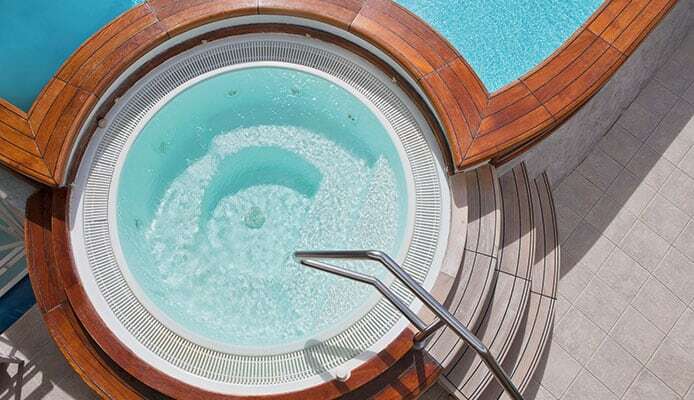 Hot tubs are a great way to ease tired muscles and calm a busy mind. Even if you followed great buying tips for hot tubs, just like you, hot tubs aren’t perfect. One of the most common problems hot tub owners encounter is the buildup of foam and how to get rid of foam in a hot tub and spa. Hot tub foam accumulates on the surface of the water, which makes for a thick and unhygienic nuisance. You can prevent the buildup of foam by using a top rated hot tub defoamer. A hot tub foam remover is a chemical solution that prevents the water from developing the layer of foam. The best hot tub defoamer will ensure that your water stays clear, foam free, and germ free. It can be a challenge to decide which hot tub antifoam to purchase, so we have made a guide to help you with the decision. With our guide, you will be breaking down foam faster than ever before. This hot tub antifoam solution can help with continual foaming problems. It is compatible with chlorine, bromine, ozone, and biguanide sanitizers. It stops and deters foaming. This is a concentrated foam suppressant that works immediately to eliminate foam. This defoamer solution will quickly eliminate and prevent foaming in hot tubs, spas, and pools. It is a water-based formula that will not disrupt the chemistry balance. It is easy to use. You simply pour and watch the foam magically disappear. It does also have a silicone emulsion element, so be cautious for silicone allergies. 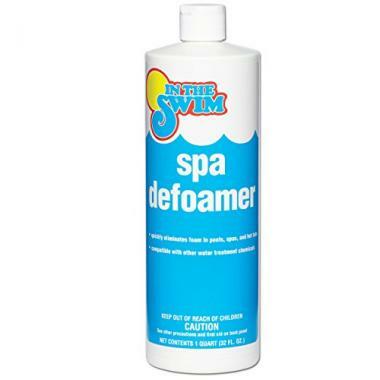 Spa defoamer reviews state that this defoamer “lasts a long time” and that the “foam is gone”. This Spa Conditioner Defoamer by Arch Chemical will eliminate any foaming in the water. It has the active ingredient of Dimethicone 27-29 percent. It also is enriched with Vitamin E to promote a skin soothing spa experience every time you use your hot tub. 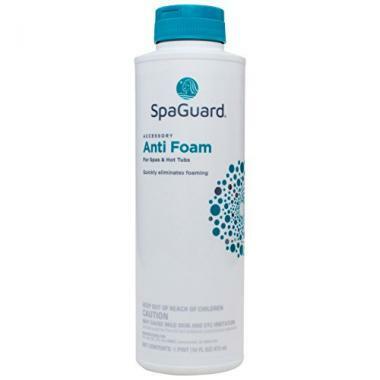 This is a Spa Anti Foam that quickly eliminates foaming. It is safe to use with spa and hot tub chemicals. The powerful formula needs only one squirt of the bottle to eliminate the foam. It won’t disrupt the pH level of your water, which makes using it worry-free. It is safe to use with chlorine and bromine-based sanitation systems. This hot tub foam remover is a water-based silicone formula. It is safe for use in hot tubs, spas, swimming pools, decorative fountains, and ponds. It does not disturb the water chemistry or leave any residue on the water. It keeps your water from being clouded too. This is a super concentrated solution that will knock out any foam. Spa defoamer reviews state this solution is “Foams worst enemy!” and a “great product”. This spa foam remover will quickly eliminate any foam. It can make your water sparkle, clean the surfaces, and filters of your hot tub. It is easy to use and comes in a convenient 1 pint sized bottle. With this defoamer, you can reach and maintain beautiful spa water. 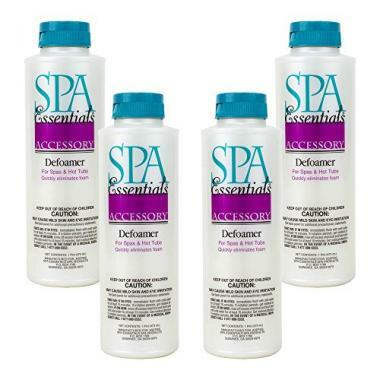 This Spa Antifoam solution prevents and removes foam in your water. It can remove the foam that is caused by the jet and circulation system turbulence with ease. It is safe to be used with all spa types. 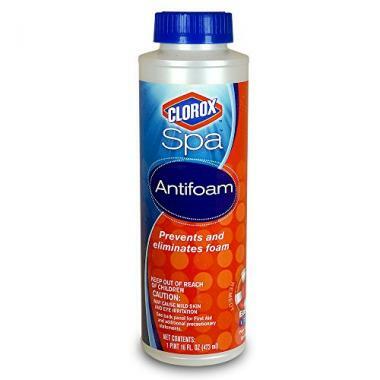 Clorox ensures that with their Spa Antifoam solution, you always have an enjoyable spa experience without foam. Spa defoamer reviews state that it “works like a charm” and “stops foam from getting out of hand”. This is the most effective spa defoamer available on the market. It eliminates foam in spas, pools, ponds, and fountains. It is safe to use with the equipment and filtration systems. It is a concentrated formula that is easy to use whenever there is a persistent foaming problem. It will prevent new foam from developing and is compatible with all sanitizer systems. This is a pack of 2 bottles that are each 16 ounces. 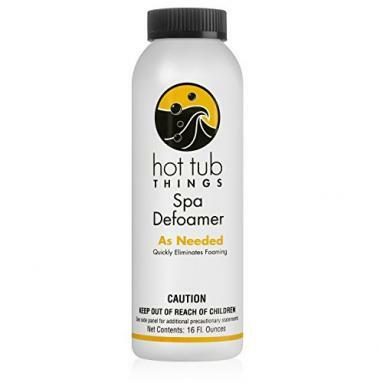 This Spa Defoamer will instantly zap foam with a heavy dose of Hot Tub Things formula. It will break up existing foam in spas, hot tubs, and whirlpools. It is safety tested to assure quality and guarantee an excellent performance. It was formulated exclusively for hot tubs and is made of the purest chemicals available. It works fast and is backed by a top brand. Spa defoamer reviews state that this product “solved the problem instantly” and that “foam was gone in seconds”. 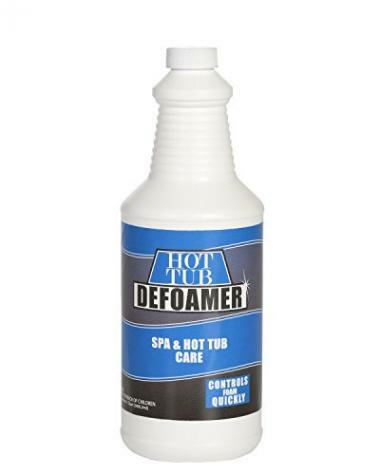 This is a specially formulated hot tub defoamer that is oil-free. It uses a silicone compound to effectively eliminate spa foam. It can tackle foam caused by body oils, soaps, and shampoos. It is a concentrated formula that is compatible with all sanitizers. When it comes to choosing a defoamer for hot tubs, it is important to consider a few features of solution before you make a purchase. You want to ensure you are buying the best spa defoamer because the chemical will be in contact with your skin, so finding the best hot tub antifoam solution is important. You will want a top rated hot tub defoamer that gets the job done, without causing adverse reactions with your skin. Not all hot tub foam removers have the same base. There are different types of anti-foam for hot tub water and each have a different active base to defeat the buildup of foam. The four most common solution bases are oil, water, powder, and silicone. Oil-based: An oil-based defoamer for hot tubs uses an oil, like vegetable oil or mineral oil, to break down and dissolve the foam. These types of oils are not the carriers for the foam. The solution is insoluble in the foam and can clear the water of the foam. Oil-based solutions often contain a small amount of wax, which tends to make their performance more effective. An anti foam for hot tub of this base can often prevent the buildup of new foam. It can also be used in pools. Water-based: A water-based defoamer uses water to rid the water of foam buildup. It uses the water to attack and carry the foam away. Powder-based: A powder-based defoamer is very similar to an oil-based defoamer, except for the fact that it comes in a powder form. The powder can be added to the water, where it will dissipate, and combat the foam by breaking it down and removing it. It can also be combined with a detergent or liquid cleaner and added to the water. Silicone-based: A silicone-based defoamer are made of hydrophobic silica, which dissolves into silicone oil when it is added to the water. It is known as an emulsifier because it spreads the silicone and easily dissipates the foam. It may also include other silicone liquids, like silicone glycol. 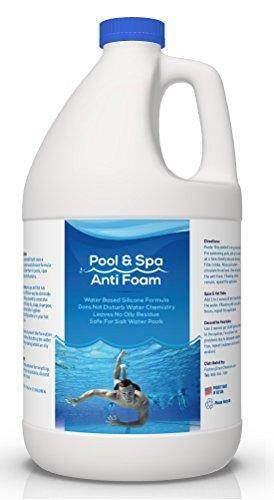 A hot tub foam remover has a variety of chemicals within its solution that assist in breaking down and carrying away the spa foam that can accumulate on the top of the surface of the water. The best hot tub defoamer can be safely used with the other chemicals of your pool, like chlorine. The chemistry of a hot tub foam remover should also be safe to be in contact with your skin without causing reaction, like a rash. Adding a defoamer for hot tubs will change the chemistry of your hot tub. Some defoamers will increase the pH level and others will lower the pH level. You will want to find a hot tub antifoam solution that doesn’t have a drastic impact on the pH levels of your water. Even the best hot tub defoamer solutions will change the pH level of your water slightly. If you learn how to balance the pH in a hot tub, you’ll be guaranteed to have clean and safe water. Similar to the pH level, the level of alkalinity of your water will change as you add a hot tub foam remover. Like pH, the alkalinity of your water can increase or decrease, depending on the solution. You should try to find a hot tub defoamer that has a minimal effect on the alkalinity of your water. Similarly, alkalinity is read in water tests, so knowing how to test hot tub water is important. Q: Why use a hot tub defoamer? A: Foam that builds on the surface of your water can be caused by a buildup of body oils, soaps, shampoos, or other spa chemicals that make their way into the water. Hot tub defoamers are useful for more than just getting rid of the foam. It can be a challenge knowing how to fix a cloudy hot tub, but a defoamer could be a great first step in trying to turn murky water crystal clear. If you regularly use a hot tub antifoam, you can prevent the buildup of future foam. It will also make the water less gooey and thick, ensuring that you have a smooth and residue free experience. Generally, the best spa defoamer can also clean the tub and remove dirt from the water. Q: Will a hot tub defoamer change the chemistry in my hot tub? A: Yes. Even the best hot tub defoamer will affect the pH and alkalinity levels of your hot tub. The best you can do is find a solution that doesn’t change the levels drastically. Slight change is okay, but drastic changes can cause problems. Q: How often should I use a hot tub defoamer? A: The best way to use a hot tub defoamer is to make sure you are adding it with the rest of your chemicals, so knowing how often to change your hot tub water is important because you can add a defoamer as you refill the tub. Depending on your schedule, you may be adding chemicals weekly or biweekly. Most hot tub defoamers can be safely used alongside the other chemicals, so that they can be easily incorporated into the mix. It can be difficult to drain and clean your hot tub, but it’s important that you stay on top of your cleaning schedule to maintain pristine water. When it comes to finding the best hot tub defoamer for your hot tub, spending the time to find the best solution will ensure that your water is crystal clear, clean, and foam free. The best spa defoamer will have you happy and relaxing in your hot tub, without the worry of germs. If you’re new to the hot tub world, this beginner’s guide to hot tub and spa maintenance can help you. If you know exactly what you need, you can save time and money by investing in a top rated hot tub defoamer that brightens your day. Do you own one of the hot tub defoamers that made it onto our list? Let us know how it has worked for your hot tub needs in the comments section below.